In a flood that takes her family's lives, Tom is the lone survivor and finds herself living with Bill in an old shed. When she finds herself pregnant, Tom moves away from Bill in order to look after her baby - The Minnow. She begins to rely on the closest people to her: Jonah, his grandfather and her Nan but memories of her family keeps cropping up. As The Minnow's birth approaches, Tom learns of pain and grief, and hope and love. The Minnow lays down a touching, coming of age story covering various complex topics spanning from teenage pregnancies to family ties and role models - just to name a few. It has a level of depth that develops as the plot progresses, coming across relatable but isn't a totally perfect read. Sweeney writes in a whimsical, almost too "airy" feel and for all its poetic-ness (yes I just made up a new word), there were instances where I started to out of touch with the intended purpose. I can see it as a reflection of Tom's mindset and her sense of feeling uncertain and unstable, but it was hard to read at times. I do know that some people found it all beautiful though, and I can recognise bits of that as well. What was more confusing though, was the progress of the plot, which used flashbacks to link different events. The transitions sometimes jumped quite strangely and I couldn't quite get it. It did send across a powerful message about developing and strengthening positive relationships, which I really appreciated. I found that the parallels between Tom surrounding herself with positive influence compared to negative influences really portrayed how important it is to keep the right people in life as a support group - reliable and trustworthy. Relationships plays a huge part in this novel actually, revolving around family and friends, and that was one of my favourite parts. It also explored the complexity of emotions and its affect on relationships, which was realistic and relatable. Especially for Tom who's still trying to find her footing and identifying herself, I could really understand her conflict in trying to comprehend her feelings towards the people in her life and the effect it had on her. The characters were unique and left a good impression, but Tom was written in a really eccentric way. I don't entirely understand the purpose of having her being able to speak to fish or dead people, but at the age of 14 I guess that was her method of coping with her traumatic experience. Personally, I fell in love with Nan and her no nonsense but affectionate nature. 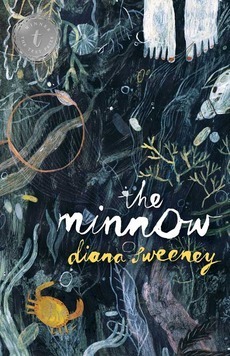 The Minnow addresses various relatable themes, but does stretch the plot over many issues so whilst having depth it was a little too complex to really grasp the entire meaning; at least for me. I liked it for being emotionally engaging and thought provoking, and did finish it relatively fast so my difficulty in reading it wasn't too extreme. I do like supporting Australian authors and am glad it won two awards. Its positivities though do make up for the smaller problems that niggled me.